The Mellon Indigenous Arts Initiative and The Fralin Museum of Art are pleased to present an artist talk by Mellon Indigenous Arts Visiting Fellow Lily Hope. Please join us for the talk and a brief recpetion. Lily Hope weaves Ravenstail and Chilkat textiles. 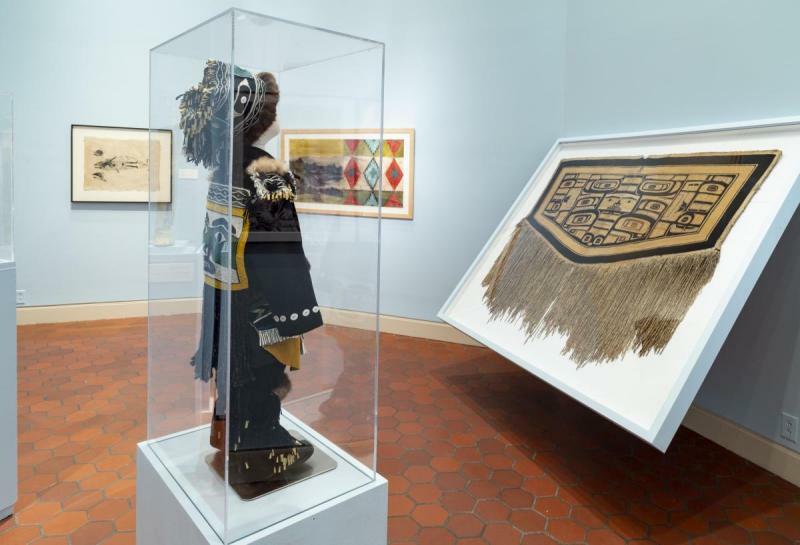 Her ensemble, Little Watchman (above, on display in the exhibition Reflections: Native Arts Across Generations) blends the two styles. Lily is Tlingit Indian, of the Raven moiety; following her matrilineal line, she’s of her grandmother’s clan, the T’akdeintaan, originating from the Snail House in Hoonah, Alaska. She teaches both styles of weaving in the Juneau community, in the Yukon Territory, down the coast of SE Alaska and into Washington and Oregon, and lectures on the spiritual commitments of being a weaver.